“The CSO vote has been unanimously taken care of, in case that’s all you were here for,” were city councilman P.G. Sittenfeld’s words of dismissal on Wednesday, June 20th at the city council meeting in regards to the concert venue that is in action to be developed at the Banks. Several people got up to leave after his swift comment, but the questions for city and county leaders were far from being answered. Music and Event Management Inc., a subsidiary of the Cincinnati Symphony Orchestra, won the vote over the Columbus based PromoWest for who would develop the venue. But we still don’t know which lot the venue will be built in, or if the City will agree to pay for the parking garage pad that will elevate the venue out of the floodplain. The lots in question are lot 27, a space adjacent to the Paul Brown Stadium which has been a popular location for Bengals fans to tailgate prior to the games, or lot 24, a much larger space across the street just south of Radius at the Banks and General Electric’s Global Operations Center. The original Banks plan as envisioned by the Riverfront Steering Committee which was established Qualls. The Bengals, which claim to have veto rights over development over three stories in height adjacent to the stadium, are partial to the venue being located at lot 24 claiming the usage of the lot for tailgating before Bengals home games. On average the Bengals play eight games at home per season. Lot 24, however, has already received a submission from a joint venture formed by Jeffrey R. Anderson Real Estate Inc., Pennrose Development and Greiwe Development Group for an $85 million mixed-use project. A mixed-use development would be in better compliance with the Banks Master Plan, which has been the guiding planning document for the entire development since 2000. The plan identified that lot for mixed-use residential development. Additionally, county leaders have valued property at The Banks at $4 million an acre, so building on a more compact location would leave room available for future developers. A site schematic of the proposed music venue. 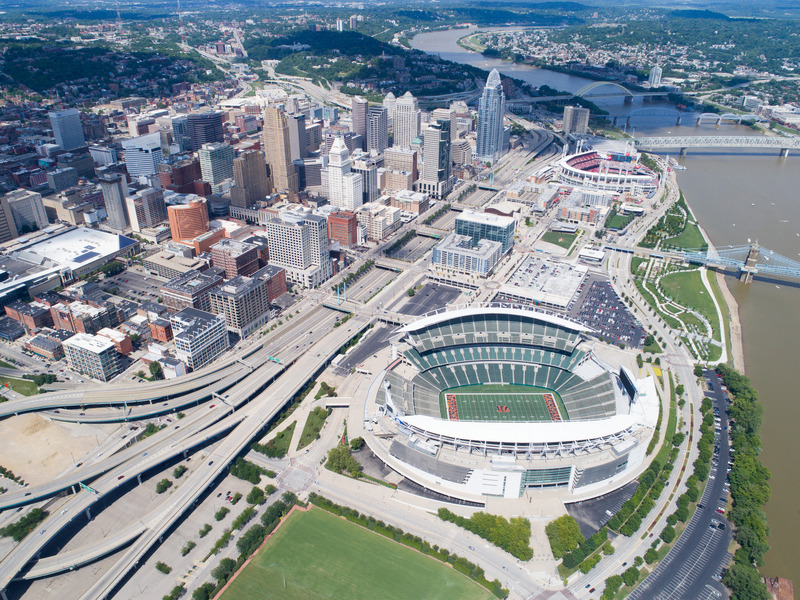 Hamilton County Commissioner Todd Portune has commented on the matter, emphasizing that the Bengals do not have veto rights, but the possibility is open for the development to go somewhere besides lot 27. Counter to that statement, City Councilman David Mann said that the Bengals do have veto rights over the property. Mayor John Cranley’s response to Mann was that direct negotiations should be made with the Bengals in order to come to an agreement on the location. Cranley said that he, too, is open to lot 24 being used as a music venue. The site already has the parking garage podium built. Tom Gabelman, the attorney advising the county on The Banks has mentioned that the symphony’s proposal incorporates developing in Lot 27 adjacent to Paul Brown Stadium and keeping Lot 23 as park space for more than 90 percent of the time when it is not being used for outdoor concert space. Portune has said that the city and the county need to come to a decision about the music venue by the end of June. Yet to be addressed is the status of the parking garage. Presently, Hamilton County commissioners expect the city to contribute up to $10 million for the garage, with all revenue going towards the county. The theory behind having the city contribute is that they would receive financial benefits from the income taxes of the people who lived and worked there. Will the plans for lot 24 to be primarily residential be ignored in order to comply with the disputed veto power of the Bengals? And if so, what does that mean for the rest of the Banks development? An 18-acre venue where there otherwise would have been residential housing could steer the Banks away from its original vision as a new downtown neighborhood teaming with residents, office workers and visitors to yet another entertainment district. While already bookended by two stadiums, the challenges are great but not insurmountable. Realizing the original vision adds more vibrancy to downtown and further helps grow the city and county tax base. Ideally, even if the venue is built where MEMI proposed there will be enough land left at the riverfront to develop a complete neighborhood with a retail scene and community gathering spaces the way it was planned. Previous articleOpinion: Could Library Building Be Option for Public Radio Move?